Pawliczko was one of three panelists at the Wilson Center on January 30 discussing the release of Aging in the Twenty-First Century: A Celebration and a Challenge, one of the most extensive reports yet on the global status of older persons (over 60 years old). The report, produced by HelpAge USA and UNFPA, is the culmination of three years of collaboration and data from interviews with 1,300 people in 36 different countries. It calls for new approaches to the way we structure our society in response to a new demographic trend that is becoming more common, known as post-mature age structures, where the average age is over 45. “[Population aging] has huge implications for the world and for us as individuals,” said Bethany Brown, policy director of HelpAge USA. “The challenge is to ensure that all people everywhere can age with dignity and security,” Pawliczko said. According to the report, the percentage of the world’s older people is set to double to 22 percent of the by 2050. Aging populations are one of the demographic trends that will shape “states’ economic and political conditions and interrelations” over the next two decades, said Richard Cincotta, a political demography consultant at the Wilson Center and demographer-in-residence at the Stimson Center. Age-structure transitions occur as a state’s median age shifts from young to old as a result of low mortality and declining fertility. This can have implications for a state’s internal dynamics as well as how it interacts with its neighbors, said Cincotta. “Political demographers…[look] at the propensity for different state behaviors to occur at different points in the age structural transition,” he said. For example, there is a higher incidence of conflict in the early years of the age structural transition, when a state has a high proportion of young adults, or a “youth bulge.” Cincotta, in his 2004 paper for ECSP Report 10, “Demographic Security Comes of Age,” wrote that states with a “large youth bulge are 2.5 times more likely to experience an outbreak of civil conflict as other states.” In the example of Japan, a high youth population proportion in the 1930’s coincided with intense militarization. Afghanistan, Iraq, and Yemen are other examples of countries with very young age structures. “The intermediate stage of the age structural transition is accompanied by a rise in liberal democracy and rapid economic growth,” Cincotta said. But the last stage in age-structure transitions – post-mature – is uncharted social territory. Some fear that smaller working age populations and shifts towards higher social welfare costs to support older generations will greatly stress developed economies and possibly even weaken their militaries. Cincotta, however, is optimistic, writing that no aging country has experienced “unusual economic of political instability” so far. “Population aging is a triumph of development,” said Pawliczko. Improved sanitation and public health and lower physical stress have allowed more people to live longer. But it’s unclear how societies will adapt to such unprecedentedly high proportions of older people. Although developed countries will proportionally see the biggest effects of aging – Germany and Japan already have median ages over 44 – developing countries will also begin to feel the effects over the next few decades. By 2050, 80 percent of older persons in the world will live in developing countries, according to the report. The report reveals that 67 percent of older persons across the globe believe that “ageism” exists in their societies and 43 percent fear personal violence. Forty-three percent report difficulties in accessing healthcare, and many older persons in developing countries suffer from easily treated ailments, such as eye cataracts or hypertension. In 2005, 15 percent of New Orleans’ population was older than 60, yet older people comprised 70 percent of the deaths resulting from Hurricane Katrina, according to the report. In foreign aid, less than one percent of humanitarian assistance targets older people, said Brown. Gender is another factor contributing to older people’s vulnerability. For every 84 men over age 60, there are 100 women. But in many societies, older women do not have access to the same economic, educational, and health resources as men. “Special effort must be made to understand and support these gender and age policy differences,” Brown said. Brown emphasized the “unique role” older people play in their communities. She pointed out, for example, that the knowledge and experience older persons have can be highly valuable in communities where agriculture is the primary livelihood, especially in light of climate change. In the Thar Desert of India, the traditional agricultural practice of constructing khadins, or farming dykes, had been lost through the generations. But as the area is being forced to adapt to changing rainfall patterns, older farmers have reintroduced the practice to preserve soil moisture. Older persons frequently operate in an informal economy. “Their economic potential is both unrecognized and unrealized,” said Brown. Relatives act as free caregivers for their grandchildren, for example, allowing the middle generation to find local work or migrate to cities. In rural China, grandparents care for 38 percent of children under five, said Brown. Economists often use the “dependency ratio,” a measure indicating the ratio of those in the workforce (ages 15 to 64) to their dependents (ages 0 to 14 and 65+), to assess a country’s economic wellbeing. But poverty and other circumstances can force older people to be economically productive until the day they die. Both Brown and Pawliczko called for a United Nations Convention on the Rights of Older Persons to protect the rights and dignity of older persons. They also called on states to structure and enforce policy that will strengthen social security and pension programs. Pawliczko pointed out that pension programs do not need to be large to make a significant difference, especially in developing countries where safety nets may be nearly non-existent. Only about 0.7 percent of national GDP is needed to fund a very basic pension program, Pawliczko said. Without recognizing and protecting the rights of older people, “we will all miss out,” Brown said. 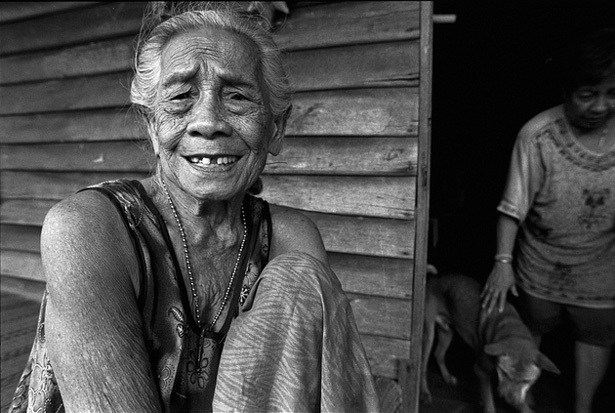 Photo Credit: “Elderly woman in Bangkok,” courtesy of flickr user Sailing “Footprints: Real to Reel” (Ronn ashore). 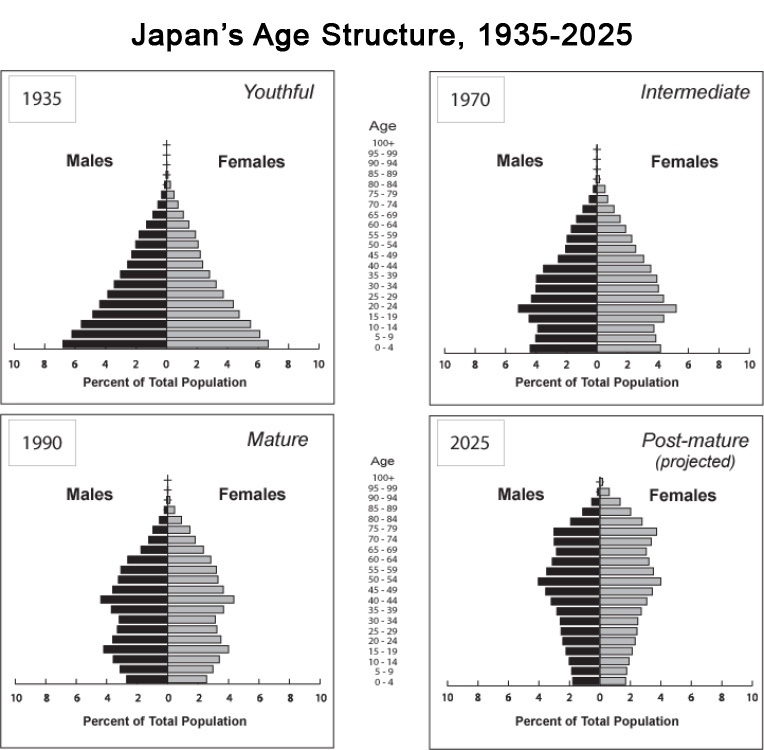 Charts: Japan’s age structural transition, courtesy of Richard Cincotta; Number of people over 60, courtesy of UNFPA/HelpAge.